a nocturne on a flute of rainwater pipes ? The topic Multiplicity of scales in hydrology and meteorology (MHYM) has been set at the École nationale des ponts et chaussées (ENPC) since 2003, with the ambition to develop observation, understanding, modelling and management of water, as a risk and resource, quantity and quality at the city’s scales under changing climate. 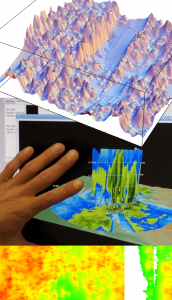 In collaboration with Météo-France, IRSTEA and EDF, MHYM had rapidly expanded as a project of the CNRS’s National Hydrological Research Program. MHYM preceded the profound changes in ENPC’s supervisory Ministry, which have gradually become involved in ecological issues, in particular climate change. These developments led to the creation in 2009 of the Hydrometeorology and Complexity (HM&Co) research axis at the Laboratory of Water Environment and Urban Systems (LEESU) of the ENPC, fallowed by the official creation of the eponymous research unit on February 15, 2016. After the formal approvals by the ENPC’s Scientific Council and Board of Directors, the unit was attributed the national identification number (RNSR 201722302X), becoming on January 1, 2017 the Hydrology Meteorology & Complexity Laboratory (HM&Co Lab), the XII research laboratory under the tutelage of the ENPC. Achieving energy and ecological transitions to a sustainable smart, resilient and attractive city requires further qualitative leaps in observation, analysis, modelling and control of the interactions between urban systems and their environment, by better comprehending the extreme variability and awkward intermittency of the whole. This is a key issue for the implementation of the COP21 conclusions. 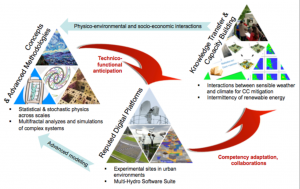 In direct link with the stakes of the COP21 and in line with the ENPC’s historical and evolving role, the HM&Co’s current mission is “to cover the observation, analysis and modelling of the variability of interactions between urban systems and their environment over large ranges of time and space scales”, i.e., developing the concept of Urban Geophysics. 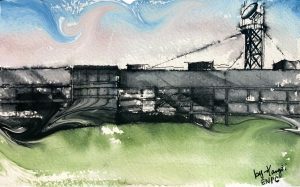 While an extreme variability of geophysical fields has been already established for a while, the recognition of “urban objects” as being intrinsically heterogeneous is more recent. However, these two highly nonlinear complex systems still have a common scientific deadlock: conventional methodologies remain generally inadequate, implying a standard recourse to case studies. Public–Private synergies: the Fresnel platform (TRL 8-9) of the ENPC’s Co-Innovation Lab. 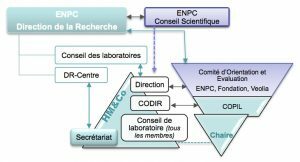 HM&Co’s scientific activities could be represented as cycling loops between the three R&I pillars: Concepts & Advanced Methodologies, Reputed Digital Platforms and Knowledge Transfer & Capacity Building. In the first loop of upstream research, the Methodologies help technological and functional anticipation, necessary to develop the monitoring and Reputed Digital Platforms. In turn, they contribute with the advanced measurements and modelling to improve the Concepts & Methodologies. The second loop of more applied research departs from the Digital Platforms as mutualised means, and through collaborations serves the Capacity Building, which arises the physico-environmental and socio-economic interactions, demanding all over again the Advanced Methodologies. Reiterations of these loops lead to the efficient mechanisms of Knowledge Transfer. HM&Co’s administration is consistent with the actual size of the laboratory, and enables to address all issues concerning the scientific activities, partnership and management. It has been built on the experience gained by the researchers within collaborative projects, using the methods and tools that have proven their efficiency.